Email marketing is one of the most cost-effective marketing mediums for every size business. Did you know that email marketing yields an incredible 4,300 percent return on investment for businesses?!! That is equivalent to $44 ROI for every dollar spent! It’s okay, don’t stifle your excitement behind that computer screen! Did you know that one of the most popular ways to send email newsletters is through Constant Contact? It is the second biggest email marketing platform after MailChimp with an astounding 15.8% of market share. But like all great email marketing services, we have a lot of work and responsibility on our shoulders to get out an amazing looking email newsletter. Yep, that includes design and copy. Well, know that you aren’t alone with the amount of time you spend sending email newsletters… In fact, email marketers average 3.48 hours a week on sending and creating emails! It’s not surprising that one of the biggest complaints we hear from marketers is the sheer amount of time it takes to create one perfect email newsletter! We have to deal with alt tags, getting the images and formatting just right, fiddling with the HTML code and along the way make sure we don’t ‘break’ anything so that it looks great on all devices. The time spent on dealing with design and formatting, take away from our valuable limited resources as marketers. It means that other pressing marketing to-do’s get further and further down our list. 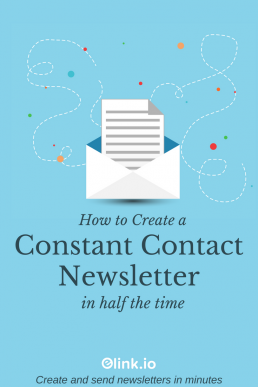 SECRET SAUCE: So how the Heck do you SAVE Time Creating a Constant Contact Newsletter? Well, we have a feeling you’re going to love us! If you use Constant Contact or any email marketing service, we’re about to make it incredibly easy for you to just focus on your email newsletter copy and generate a modern, responsive email newsletter in 5 minutes! Elink.io is a smart tool that helps you create flawless email newsletter HTML code in no time. All you have to do is enter web links of content you want users to engage with, and elink.io does all the heavy lifting. elink.io instantly generates images, titles, and descriptions for each web link you enter. You just add a header image and intro text and then publish your newsletter. It’ll pump out your HTML code that you can copy and paste into Constant Contact, and you’re done! YES, it’s that easy to create a modern and responsive newsletter. Elink offers over 19 responsive and visually appealing layouts to make your newsletter stand out. The best part is, you can change the layout of your newsletter anytime to try out different styles and pick the one that looks best! Copy and paste the URL of any content on the web and elink.io will automatically display an image, a title, and a short description of the link. Just copy and paste the link and we will make it awesome! Give your newsletter a header image, a catchy title and a short description by choosing the “Header 1” template. You can even add your brand’s logo and tagline to make it more personalized. After publishing, go to your dashboard and select the newsletter button. Copy the HTML code and get ready to export your newsletter to Constant Contact! And that’s it! You no longer have to compromise on the quality of your email at the expense of time and effort. Send better emails and newsletters with Constant Contact in minutes, with a little help from elink.io! PS: If you don’t use Constant Contact, you can also use Gmail, MailChimp, Active Campaign or any third party email marketing service to send out a visually appealing newsletter with the help of elink.io! Let’s chat below! How much time do you spend creating email newsletters? Comment below! Thanks for this great advice. This is so well explained. Oh, this is perfect. I’ve been looking for a newsletter service. I will have to test this one out. Never thought of using this option before… but your post has made me curious to check how it works. Very nicely explained !! I really want to do a newsletter so thank you for showing this tutorial! I’ll be trying it out for sure. I don’t do a newsletter but i want to learn, so this tutorial of yours will be very helpful to me. Thank you for thinking of this. This is so handy, I’ve been wanting to start a newsletter for a while but never know where to start, I’ve used mailchimp but I get really confused. I’ll have to check this out as it seems really easy to use! Never heard of this brand, but I love how you went in detail to explain! I am currently using Mailchimp but I wil check this out when I reach that threshold! My school assignment asks me to make a newsletter and I don’t know where to start. But your article gives me all the useful information I’ve been looking for. Thanks for your sharing.